KM Strategy: Does Maturity Matter? Maturity is linear. When something reaches its full potential through development. There is great value in using measures, indicators and criteria to diagnose an organization in their current state through an assessment. I don’t think that a maturity model within itself is the right tool or terminology to use. Would you rather be mature or fit? How about fit and mature? That doesn’t make a lot of sense. An organization is a body. It is healthy, unhealthy, it grows and it shrinks and it can be sick. It is impacted by internal and external events. In a sense, it lives. It doesn’t make sense to state a living composed entity is mature or immature when it comes to sharing knowledge. It does make sense to understand what changes are taking place and if these changes are having a positive or negative impact. Is the organization healthy? What can we do to make it better? Small efforts? Large efforts? What kind of change could we tolerate as an organization? Is Knowledge Management part of Change Management? A KM Strategy is multidimensional. This means that steps and process exist but there are elements of the approach that occur in parallel or through overlapping operations. 3) Know the history of an organization. You can tell where you want to go from where you are but you also need to know where you came from. It is a story that spans the lineage of the organization. 4) It also must look at who the people are as a body (demographics) and what the culture is. What kind of organizational change can the employees tolerate? 5) Is the organization healthy? What will it take to get us there and maintain good health? Lots of other things to consider in a KM strategy but consider business strategies for a moment. It doesn’t matter if you 8, 18 or 80, the good doctor is going to tell you to eat right, get some exercise and pay attention to some indicators to keep fit. You can’t control outside events or catastrophes but you can maintain your ability to be Antifragile (thanks Nassim Taleb). If you let yourself go by eating unhealthy or ignoring your responsibilities to yourself, it will have an adverse impact on you and others. We are all part of a system of systems. In a KM engagement, someone asks “How do we fix our search problems?” Well, first you need a Knowledge Maturity Model and then you need to invest more in SharePoint. Same question on health, “How do I lose weight and get healthier?” First, you need a Health Maturity Model, and then you need to buy a gym membership. It is solving the wrong problems with great precision (also known as a Type III error). Instead, we have to consider the whole body of the organization and what steps we need to take that can become part of our culture and that we can form habits around. In blog post dated September 2011http://billives.typepad.com/portals_and_km/2011/09/creating-global-knowledge-sharing-networks-at-conocophillips.html Bill Ives discussed a talk by Dan Ranta Former Director of Knowledge Sharing at Conoco Phillips. Measured savings / gains of estimated 9 Billion. Conoco Phillips has been previously recognized as one of the best organizations practicing Knowledge Management. Where is Conoco Philips now in terms of Knowledge Management? … If they are doing it well today, they are missing the voice of Dan Ranta. In other words, we don’t know about it. This doesn’t mean that they aren’t “performing well” but I am guessing that Knowledge Management isn’t today what it was just a year or two ago at Conoco. What happened to at BP? … There have been many instances of discussion on BP and their knowledge sharing failures since the gulf crisis. Most energy companies have a top knowledge sharing capability when it comes to safety. This was a serious blow to BP. 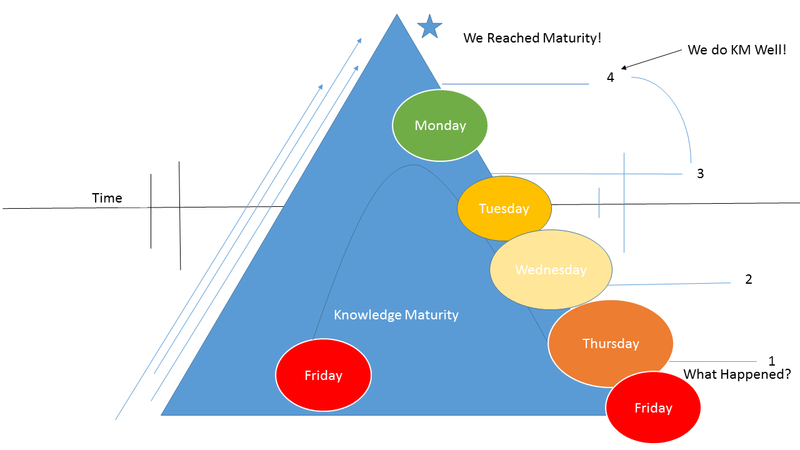 If Google uses a Knowledge Maturity Model, I haven’t seen any evidence of it. For that matter Apple and others in high collaboration tech companies don’t seem to need it. It is sort of akin in my mind to going to the gym and seeing the difference between someone who goes every day and someone who goes once a quarter or more. This is about practice. If an organization as a body takes the 21 day challenge (culturally) and makes Knowledge Management a habit. It will still need health indicators and diagnostics for the purpose of tracking and tuning change relative to conditions (like Change Management). Measure compliance with KM expectations. He is saying that KM is not linear and doesn’t essentially become mature. He identified indicators of health (from my perspective) to measure KM. It seems that if you look at the indicators, measures, capabilities and gaps through a KM diagnostic (what is known today as a Maturity Model) and further leverage concepts around the expectation of non-linear change, a healthy knowledge sharing organization can be achieved and maintained. Practice your KM everyday, exercise your collaboration, communication and cooperation, learn, use tools to enable success, and keep an eye on the heartbeat of your organization. Come back in a year for a check up, I promise no rubber gloves. “Maturity models describe the development of an entity over time. The entity can be anything of interest. It can be a human being, an organization, a technology, a product, a process etc. Maturity model gives a path to improvement. Maturity Model can also be used as a basis for comparison (Klimko, 2001). Maturity models are driven by the necessity to have a clear cut road map for any organization that is embarking on knowledge management implementation. It provides the clear vision with a description of the path ahead. Knowledge Management Maturity Model (KMMM) can be considered as an application of structured approach to knowledge management implementation. In other words development of a KMMM is nothing but engineering of KM. IEEE Standard 610.12 define ‘software engineering’ as the application of a systematic, disciplined, quantifiable approach to the development, operation and maintenance of software- that is the application of engineering to software(IEEE, 1990). In consistent with this definition we can define Knowledge Management Maturity Model as the “application of systematic, disciplined, quantifiable approach- that is an engineering approach to development, implementation and successive progression to attain maturity in knowledge management”. Maturity model can also provide a common understanding of the terminologies involved in knowledge management implementation to various stakeholders. Maturity models have the following properties (Klimko,2001,Weerdmeester et al., 2003). Ø Levels are characterized by certain requirements which the entity has to achieve on that level. Ø Levels are sequentially ordered, from an initial level to a final level of perfection. Ø During development, the entity progresses forward from one level to the next. No levels can be skipped. Since perfection is not obtainable in this life, we might be looking at maturity models as more of stage changes within our organization. Changes are better for certain situations than others but also can be used over and over again…if need be. So, for example best practices today might not mean best practices for tomorrow but instead a shift from one stage of development to another, but most importantly always moving towards a common goal. When the goal changes then we have to consider is the stage of our development as an organization correct or do we have to decide on a new stage of development because of the goal changed. This is why for perfection; we don’t have a goal change but an understanding of the goal itself. What we put at the top of our priorities is very important for life itself. If KM is going to be effective to me, first and foremost we need to align our priorities within the organization. And my dear friend is something very hard to do in a diversified society where globalization is now being touted as the answer for our future endeavors. A maturity model may not be the problem in situations that demand discontinuous change in an organization. The issue, it seems, is the level of detail. An enterprise such as Knowledge Management, like an organization, can be comprised of many components (e.g., service lines). The constellation of components can be changing continuously to adapt to market demand or to requirements of the associated value chain. Maturity can be applied to components (e.g., CMMI for Services), and organization or enterprise disruption can occur through the creation and elimination of components (e.g., new offerings). Together these two kinds of change within a constellation of service lines can be a powerful combination for the creation of value (e.g., Four Actions framework of Blue Ocean Strategy). A discussion of levels of analysis implies that there needs to be a more nuanced understanding of KM by decision makers who pay for it and by those who use it. As a person outside of KM, I am struck by how much more sophisticated the thinking is of KM professionals than that of KM buyer and users. It seems to me that the term, KM, itself has become a problem. Its value proposition is considered anachronistic, a remnant of the 1990s, by business scholars and leaders. The general understanding of KM in business is far behind the thinking and experience of KM professionals. Let KM buyers and users think of KM in terms of organizational components, and let maturity models for KM be applied to those components. On this foundation, leaders in the KM community need to rebrand themselves as Systems Architects. Their development and redefinition needs to parallel what is happening to the changing roles of CIO who increasingly are involved in a wider range of organizational functions and decision making in the C-Suite. Frankly organizations should be looking to the most experienced KM leaders for their next CIO.